As you know from previous newsletters, the Monarch Waystation Network is in a transition period. Funding has not yet been secured to continue the half time Education Coordinator position. For all of you who completed the survey I sent out, thank you!Your responses were truly vital in helping us develop a future plan. I also sincerely appreciate the heartfelt responses, compliments, testimonies and overall warmth. Your passion is inspirational and certainly helped with our decision-making! Below are the highlights of the plan you helped develop. Survey data shows an overwhelming number of you read 75% or more of each newsletter, so…. Instead of coming from my ku.edu address, they will most likely come from a monarchwatch.org email address. Please continue sending pictures, stories, news updates, etc. of your gardens and your students to be featured in future newsletters. Survey results showed an overwhelming popularity of seeing “real-life” examples of students engaging with monarchs and other pollinators! It is truly beneficial for us all to see that when we engage students in these ways, we become part of something much bigger than ourselves or our individual schools! I strongly encourage you to continue sharing your pictures, stories, questions, and impacts these educational opportunities have on your students, schools and communities. As my matt.tucker@ku.edu address will cease to exist after June 12, during the next two months, please send any MWN-related emails (material for future newsletters, questions, etc.) to our Communications Coordinator, Angie Babbit, at angiebabbit@ku.edu. The MWN website will remain up and running. At this time, we are uncertain how often it will be updated or modified, but all of the current content will remain as is for now. Contact Angie Babbit at angiebabbit@ku.edu for MWN website-related items. Jim Lovett (jlovett@ku.edu) still maintains our main Monarch Watch website, which is a separate site. To clarify, the Monarch Waystation Network (this network for schools and nonprofits working with students) and the Monarch Waystation Program (garden registration and signage) are separate Monarch Watch projects. This staffing change only affects the Waystation Network. Nothing related to our Waystation Program is changing. As a former teacher, I know how busy this time of year is for you. Amidst all of the tests here in April, try to carve some time to take your students outside. You don’t need a big lesson planned. Just have them simply sit with their journal and observe. By facilitating these opportunities, you instill the importance of truly observing their surroundings. You never know what you may see… as I took a short break from working on this blog to stare out my window, I saw a speck of orange flutter by my window. Was it a monarch? I quickly walked outside and into Monarch Waystation #1. Sure enough a female monarch was searching for milkweed on which to lay her eggs. I excitedly watched her search for a few minutes until she flew out of sight. If I had not been taking a minute away from the computer screen simply stare into the outside world, I may have missed seeing the first monarch of the 2017 migration here at the Monarch Watch office. We all miss so much when we are plugged into technology, inside, too busy, multi-tasking, or simply not truly mindful of what our eyes may witness. Taking your students outside to simply observe nature can truly bring about an awareness that a book, classroom activity, nor internet image can ever provide. It may take some guidance and practice, but providing your students with repeated opportunities to simply sit and observe nature, can truly open their eyes to a new way of seeing their world. The monarch migration sparks awe and wonder in people of all ages. Teachers all across North America incorporate the migration into their classroom in numerous ways. Our friends at Journey North have incredible, real-time maps that allow you to follow the migration. Using data submitted by citizen scientists, like you, the maps document first sightings of monarchs (adults, eggs and larvae) as well as the first milkweed shoots to emerge in the spring. Easily report your observations and use these resources to participate in the migration, no matter where you are! Learn more about connecting the monarch migration to Common Core and Next Generation Science Standards by visiting our Curricula page! Are you and your students anxious to turn out your classroom lights, shut the door and head outside to your garden? Learn about a few key tasks before dashing outside, so that your excitement leads to positive-not detrimental- garden outcomes! Depending on your location, you may or may not have begun working in your gardens yet. I have received lots of questions about the first garden tasks of the spring. Below is a general list of common tasks completed in late winter/early spring. Since the Monarch Waystation Network supports educators all over the country, the timing of the tasks varies depending on your location, and depending on the given year’s weather patterns. This list was compiled from numerous resources. If you have other tips or tasks that you feel should be added to this list, please email me. I would love to make this a more substantial list, with your input. One last note, is the tasks here are listed in no particular order. Repair structures, such as raised beds, fences, paths, water sources, native bee houses, retaining walls, seating areas, trellises, etc. Clear drainage ditches so spring rains have adequate runoff (consider planting a “rain garden” in the future…more details soon). Sharpen and oil your garden tools. If your soil is too wet or still frozen, wait until it dries out some before walking around on it. This will prevent the soil from becoming compact, which can result in poor drainage and aeriation for the rest of season. Have your soil’s ph level tested. Milkweeds and most native plants prefer soils as close to neutral as possible. Most local cooperative extension offices provide soil tests for free or a nominal fee. Prune back dead stalks, stems, bushes, grasses, etc. to remove biomass and allow space for new growth. Be easy with digging and scraping in the soil. Roots begin growing long before new shoots emerge, so you don’t want to damage the roots. Once shoots emerge, add compost around the shoots. If you choose to add fertilizer, now is the time. Most perennials only need to be fertilized in early spring, and no other time of the year. Choose an organic, slow-release fertilizer that is either balanced (10-10-10) or one with a higher Phosphorous level for root growth (5-10-5). If you can't find a good, organic fertilizer with a higher ratio of Phosphorous, you can add a little bone meal or rock phosphate. If you want to divide plants before fertilizing, do so once shoots emerge, but are less than 4 inches high. The official 2016-17 monarch population figures have been released. 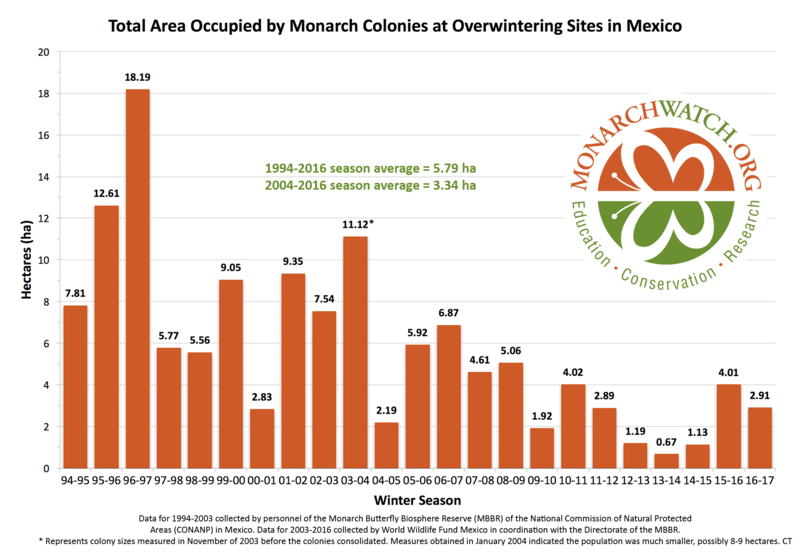 World Wildlife Fund Mexico in collaboration with SEMARNAT and CONANP and the Monarch Butterfly Biosphere Reserve (MBBR) announced the total forest area occupied by overwintering monarch colonies. Thirteen (13) colonies were located this winter season with a total area of 2.91 hectares. Click the graph to open a larger view. The potential uses of this graph in your classrooms seem infinite! Be sure to use our forum to share the ways you successfully incorporated in in your class! *Aerial photo of the El Rosario Monarch Colony, Mexico. Photo by L.P. Brower on February 26, 1999. Here it is mid-February, and my office window has been open this whole week. These unseasonably warm days do not seem "normal" to me. However, since I have not been documenting these "first signs of spring" as part of the National Phenology Network's incredible phenology tracking project, I cannot use data to back up my claim that spring is arriving early! In actuality, I would not document and report when I first open my office window each year. However, most of us do make general observations regarding spring's arrival- when the first crocus blooms, the first monarch sighting, when we first hear bullfrogs, when apple trees or lilacs bloom, or even when allergy season starts. So, why not take a few minutes to report what you and your students observe in your garden each spring, and contribute to an extremely important scientific database? If you need more of a focus, USA-NPN has a specific campaign- Nectar Connectors- to obtain data on pollinator plants. Knowing when and where nectar sources are available for monarchs and other important pollinators across the country is vital in driving conservation-related policy. The USA National Phenology Network serves science and society by promoting broad understanding of plant and animal phenology and its relationship with environmental change.Nature's Notebook is the USA-PNP project to connect people with nature to benefit our changing planet. Teachers, students, researchers, and volunteers collect and report standardized ground observations of phenology. To participate in this important scientific research, click on the link above. Setting up an account is super easy, as is reporting your data. There's even an app for quick reporting while in the field! And don't forget to share your experiences in our forum, the backbone of this Monarch Waystation Network! Since I began working as the Education Coordinator for Monarch Watch in April, I have had the pleasure of working with, getting to know, and supporting many incredible educators, students and community members! The past nine months have been filled with exciting moments, learning moments and inspirational moments. I want to personally thank each and every one of you who has been a part of this journey. I am honored to support you along the way. Below is a summary of this time, along with some image and quote collages. We have accomplished a lot in a short amount of time, and I am looking forward to accomplishing even more in 2017! Remember, I am here to support you and your students. What this looks like is an evolving process, so let’s all be creative and reach even more students this year! I know you are busy, so below are just some of the many highlights from 2016 to ponder as we head into a new year together! -Since beginning the Free Milkweed for Schools and Nonprofits program in 2014, Monarch Watch has delivered a free flat of 32 milkweed plants to 560 different recipients. Of these recipients, 303 were schools and 257 were nonprofits. In addition to these 303 schools, I also reached out to the schools that already had certified Monarch Waystation gardens before our free milkweeds program began in 2014. In all, there are currently around 1,500 documented schools receiving support through the Monarch Waystation Network! The forum truly creates the foundation of this project, and sets it apart from other monarch-focused education programs. The forum is a place for schools, educators and students to connect, share ideas or lessons, ask questions, post pictures and gain inspiration. There are currently 164 teachers and students registered on the forum. The forum has the potential to be a very special and unique form of support for you, so I hope 2017 brings more activity and engagement. Please let me know how I can improve this to make you want to participate more. -The goals of the newsletter are to provide quick tips, small bits of information, highlight inspirational stories, and basically to regularly remind you that I am here to support you and your students with this project. -Poster presentation at the National Association of Biology Teachers Conference. -Solicit more feedback and suggestions from you, because the more ownership you have of the Monarch Waystation Network, the more successful and sustainable it will be. -In December, Monarch Watch was awarded funding to extend the Free Milkweed for Schools and Nonprofits program another year, which will add an additional 160 schools to the MWN! With the inevitable leadership change underway in our nation, we all face uncertain times. Nonprofits, such as Monarch Watch, are accustomed to riding the waves of administration changes. Sometimes the wave can seem like a tsunami, but together we can keep working for the greater good. Together, we can ride the wave. The earth and all of the precious inhabitants depend on this unity. Specifically, the survival of many of the world's threatened species depend on the amount of work and advocacy nonprofits and compassionate individuals can accomplish. What sets pollinators slightly apart from many other imperiled species is the fact that we as humans depend greatly on them. According to the United States Department of Agriculture, animal pollinators are directly responsible for pollinating more than 35% of the world's food crops and 75% of the world's flowering plants! It is true the plight of pollinators has begun to grab the attention of many people the past few years. However, even with a little spotlight attention, pollinator numbers continue to decline at a rapid rate. The spotlight needs to be brighter. As the thumb of an administration that views environmental activism as a block to economic development looms closer, now is the time to turn emotions into action. We all must find ways to advocate a little louder and more intently. The pollinators need our help. The planet needs our help. So, how can we put our thoughts and emotions into direct action? And as always, please contact me or visit the forum to share stories, pictures or examples of projects you and your students are involved with that fit this theme of turning thoughts and emotions into action that directly helps our environment. I will then share your experiences in order to inspire others! It’s official, the Monarch Waystation Network has been launched! ...And just in time for the Monarch Migration! Hello! I hope each and every one of you have had a wonderful summer! As a former teacher, I completely understand the varied emotions you may be feeling here in mid-August, as a new school year is either underway or approaching:) And I also realize how incredibly busy you are! I am writing to update you on the Monarch Waystation Network. After a fairly steep learning curve, I have gotten the website to the point I feel comfortable in launching it. Is it complete? No, but it was always intended to be an evolving process, a project that morphs as your needs dictate. To hopefully save you time in reading, I will list the main components of the website, along with any essential details or information. FORUM- A place to share ideas, lessons, questions and pictures. A place to connect with educators and students. A place for inspiration! For confidentiality purposes and to maintain focus, this is set up as a private forum. You must register first (I’m sorry, one more username and password to remember...but it’s for a really great causeJ), and then wait for me to approve the registration. This will hopefully prevent scammers and forum trolls. The forum is the real backbone of this entire Waystation Network project, and the future of this project depends on the level of engagement and activity! CURRICULA- My job is not to design curricula, but to connect you to existing Monarch-related curricula. I have combed the internet and provided links to the “best” (I’m always open to suggestions). I am partnering with someone to align potential Waystation garden activities to the Next Generation Science Standards and to the Common Core Standards. This section of the website will certainly be evolving, and our hope is for lessons to be continually shared on the forum, and then I will transfer them to the website. GARDENING- Tips, information and resources to support the maintenance of your Waystation gardens. This will be broken into parts, such as Milkweed, Common Waystation Plants, Garden Maintenance, etc. INSECTS- A place to learn more about Monarchs and other insects visiting your Waystation gardens. OUTREACH- An interactive map showing the general locations of all the certified Waystation gardens, a link to a great selection of free PDF downloads, and tips for involving colleagues, administrators and/or community members in our garden. Short-term goal- Teachers, students and nonprofit professionals will register on the forum and generate discussions and connectivity, by posting pictures, asking questions, sharing lessons or merely stating what you are currently observing in your Waystation. Long-term goal- To facilitate a unique, sustainable, interactive network for teachers, students and nonprofit professionals to help conserve the Monarchs and their migration by exposing youth to meaningful educational opportunities through self-instruction (i.e. we want to encourage your students to ask questions and seek the answers). Our intent is not to provide all the answers, but to guide the learner in her/his self-directed educational adventures! Please help this interactive project get off the ground by taking a minute to register on the forum and let everyone know what you are currently observing in your Waystation gardens! Copyright 2016 Monarch Watch. All Rights Reserved.